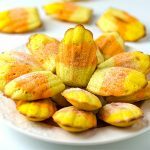 EASY CHOCOLATE DIPPED MADELEINES – Classic Madeleine recipe dipped in chocolate and decorated with chopped pecan or walnuts. 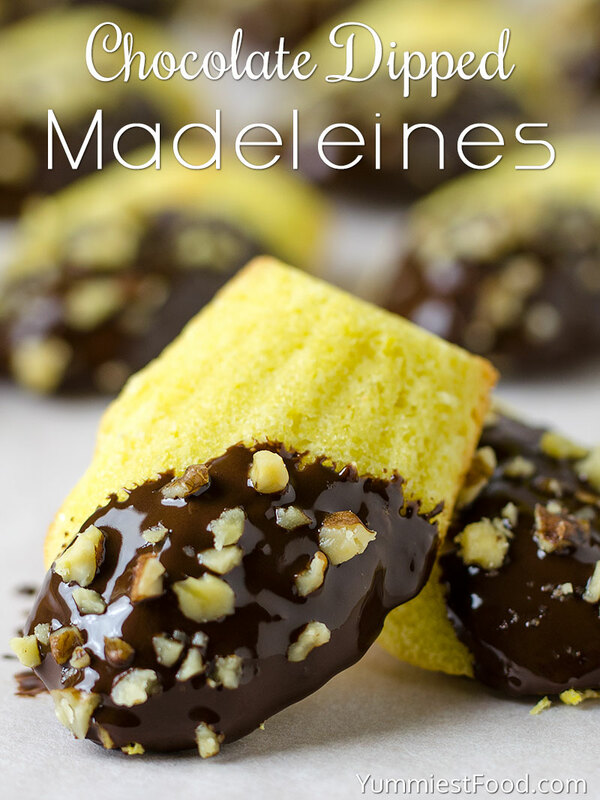 This Easy Chocolate Dipped Madeleine is fun and delicious! 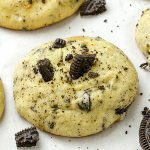 I love Madeleine cookies they are one of my all-time favorites. I remember as a kid, visiting my grandmother, she always has this in the biscuit tin. The flavor of this cookie is just so divine. They are deliciously buttery and sweet. 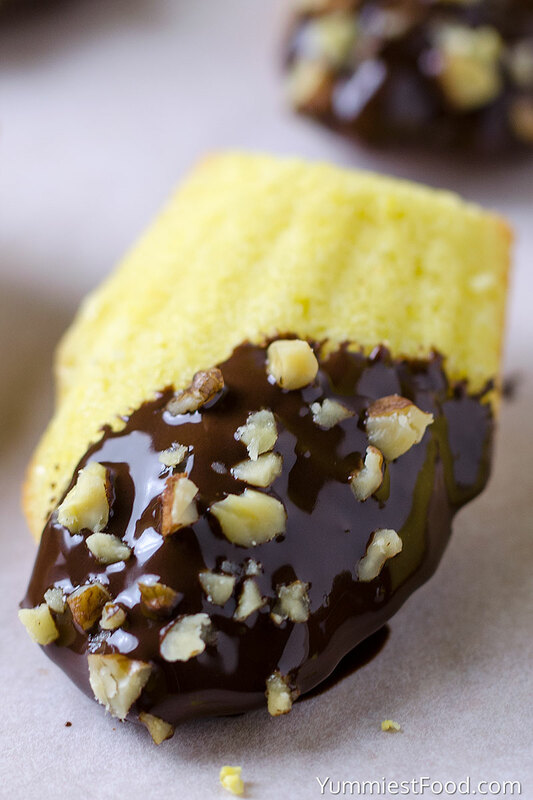 Chocolate Dipped Madeleine is so incredibly easy to make and they bake in about 10 minutes. You will need a Madeleine pan to make this. Madeleine is a small butter cake with the beautiful shell shape. 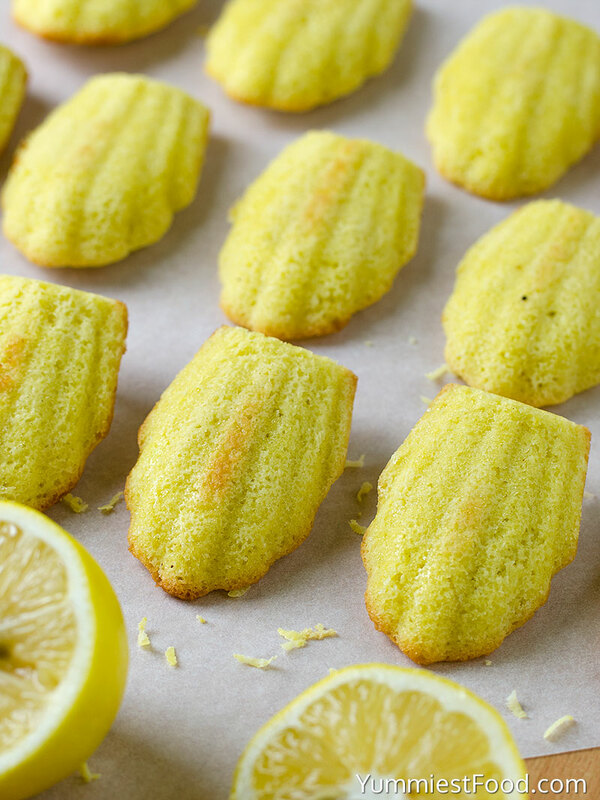 Each Madeleine is firm with crunchy edges with the hump in the middle of the cake. The process is pretty easy. You start out by melting butter and setting it aside so it’s cool by the time you need to use it. Next, you beat eggs, vanilla extract and salt until frothy. 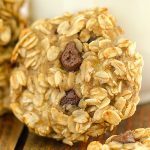 Gradually add sugar while beating for 3-5 minutes, until mixture is thick (mixture will form ribbons when beaten is lifted). Fold in the flour and use a spatula to mix well, add lemon zest then pour melted butter over batter and gently stir and blend until combined. Add about 1 tablespoon of batter into madeleine pan (don’t spread it) and bake about 10-12 minutes until puffed and light brown. To make the Madeleine extra humpy, chill the batter in the fridge for a couple of hours before baking. They are so good with a cup of hot coffee or tea! The most common toppings are a simple glaze or a dusting of powdered sugar. This recipe is for basic Madeleine. Everyone loves a rich buttery madeleine with a texture of the cookie and a cake. 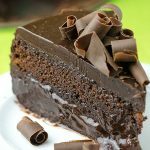 I like to add chocolate and fun toppings you get a delicious and beautiful treat. If you have never tasted Madeleine cookies you have to give it a try. These mini cakes are a delight and perfect for a tea party or any special occasions. We really enjoy them because they are just the right size to hold in your hand and two Madeleine is all that is needed to satisfy that sweet craving. Enjoy and have a wonderful day!